Buckwheat noodles I wonder how these taste? 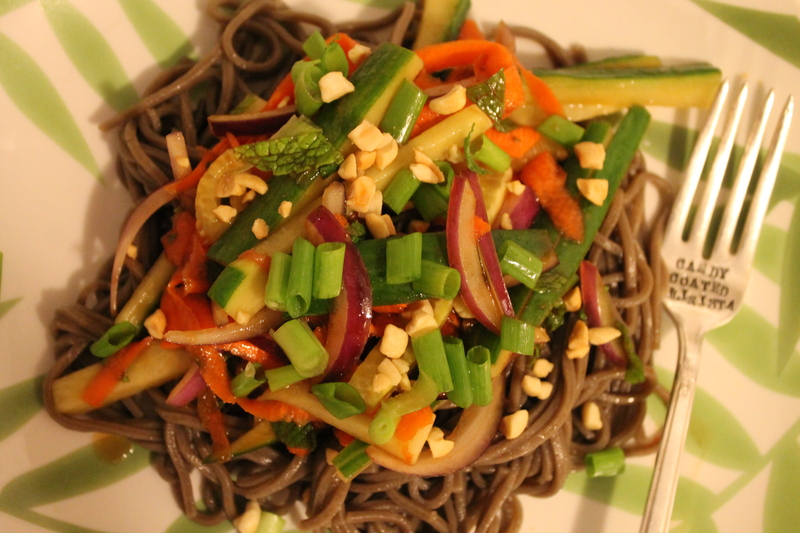 This cold Soba noodle salad is a vegans or vegetarian heaven; but for me I was looking for the protein. 1. Using a medium saucepan bring water to a boil and widely spread one bunch of soba noodles in water. 2. Cook in the boiling water for seven minutes, stirring occasionally. 3. Meanwhile prepare the red onion, carrots, English cucumber and spinach and set aside in a bowl. 4. In a small bowl whisk the dressing ingredients together. 5. Once the soba noodles are cooked, drain and rinse in cold water three times and plate. 6. Place the vegetables on top and then drizzle with dressing. My first thoughts were, this is so tasty but near the end I was thinking, this is in need of some protein like chicken. The flavours were there, but for a meat lover like me I still wanted some protein. Another great make ahead Thanksgiving or Christmas recipe that can be used in stuffing, gravy and day after soup. 1. Preheat oven to 450°F. 3. Check every 30 minutes and flip. 4. Meanwhile using a large stock pot add ten cups of water and bring to a boil over high heat. 5. Once turkey is done, tear apart the wings and place all the turkey pieces along with the vegetable into the stock pot. 7. Gently simmer over low heat for 4 hours. The stock will reduce down. 8. Let cool and pour into jars and chill. •	Use the leftover turkey for whatever you like. I saved the drum sticks for dinner as they remained whole and the turkey wings were put in a quick turkey soup with the rest of the veg. 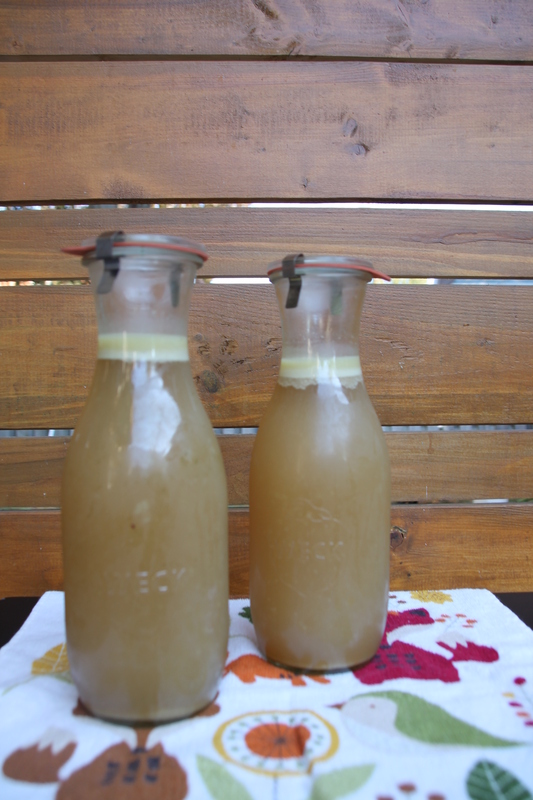 •	You can also freeze this stock. Not going to lie here this is a lot of work for stock; but then there are no preservatives, sodium or salt and chemicals. So start this in the morning and go about your day in the house and let this reduce while you’re doing chores and other baking. There is no salt in this recipe so it won’t be as flavourful as you expect; but it’s best to salt whatever dish you put this into after the fact. I went to my first Authentic Thai restaurant in February and ever since I have been intrigued by this cuisine and trying to consume and slowly try all things Thai. It’s one hundred percent thanks to this amazing Tamarind chicken I had and the taste and smell is still stuck in my head today. I love the sweet and tangy aspects to the tamarind as we have this fruit in the Caribbean and I remember pulling them of the tree and them being scattered on the streets all over Barbados & Antigua. This dish made me want to try Thai food more ad even though I’m not a curry fan I am finding Thai curry dishes to have a very different spice taste then Indian cuisine that I am not fond of. I am exploring this new flavor profile; but for now only with the rice and salad dishes and then on to noodles and proper Thai curries. 1. In a saucepan over medium-high heat cook rice and set aside. 2. Using a wok add peanut oil and fry garlic cloves and onion for a couple of minutes. 3. Add the Jasmine rice along with soy sauce and curry powder. 4. Add carrots and frozen peas, and let cook for 10 minutes. 5. Crack the egg into the fried rice and stir around. 6. Add in the pineapple, spring onion, cilantro and peanuts and stir for 1 minute. •	Serve in a pineapple boats if desired. 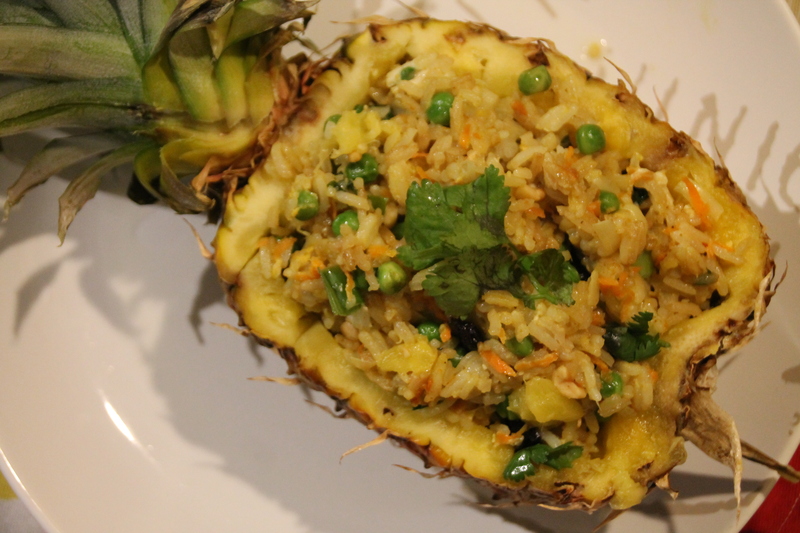 Just carve out the pineapple and pour Thai fried rice inside. This is a totally new food for me and I honestly wanted to make this dish because of the pineapple boat and that wow factor when serving this dish. As I am not a huge curry fan I didn’t add tons of curry powder; but the colour and smell was wonderful and flavouful. I loved all the added fruit & vegetables in the rice. I have been craving shrimp for a while now and I figured it was time to make something shrimp related. 1. Clean shrimp and place in a bowl. 2. Add garlic, kosher salt & black pepper and mix then set aside covered with saran wrap. 3. Using a wok over medium heat add some spicy ginger oil and fry the shrimp. Add some plum sauce after the first few minutes. Once cooked set aside. 4. Add more spicy ginger oil and fry broccoli, carrots, red onion and plum sauce for five minutes. 5. Add in the shrimp and mix. 6. Plate and sprinkle with sesame seeds. 1. In a pot, cook the rice in 1 cups of water over medium-high heat until cooked. 2. In a small saucepan cook the mixed vegetables and drain. 3. In a wok with 4 tbsp of spicy ginger oil and fry rice and add in the mixed vegetables and stir frequently for 5 minutes. 4. Add egg and continue cooking for 5 more minutes. 5. Add soy sauce and toss until coated. My taste tester loved this and was very surprised by the treat. They love Chinese food but always buy it at the restaurant, so I decided to make them my version. This was eaten for brunch, as they couldn’t wait which made me laugh. I seem to have a lot of testers that just can’t wait to dive into the food I prepare which is a lovely feeling. 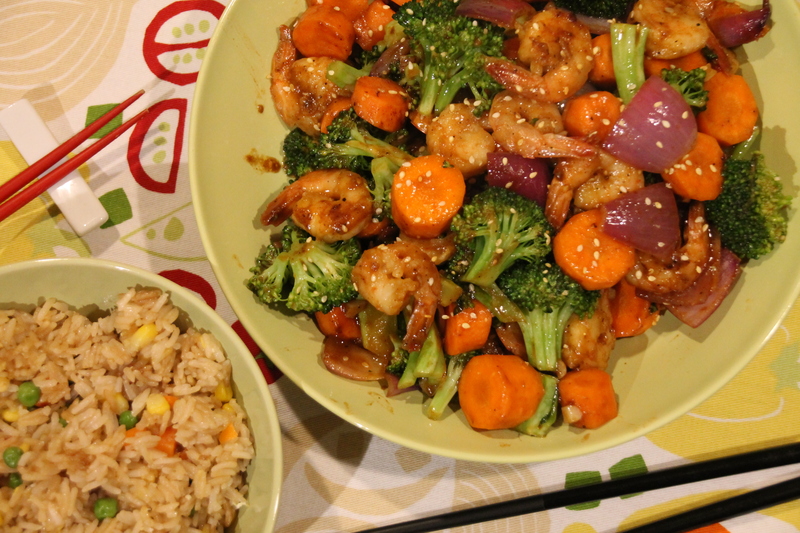 I loved the slight kick of the ginger that coated the shrimp and the sweetness of the plum sauce over the Crunchy vegetables. Funny enough when I was showing a co-worker this picture another co-worker of Chinese-Vietnamese decent saw it and said it looked great. She asked my other co-worker to sneakily ask for the recipe for her. If a Chinese person wants my recipe I have done a good job. I am now officially a big fan of adding an egg to my fried rice and can’t believe I only started doing this last year. I really should have been doing this a long time ago as it just add that little bit extra to the rice. On a biscuit kick and craving comfort food I ventured into a biscuit chicken pot pie. 2. Season chicken thighs with salt, pepper, oregano and basil and bake for 25 minutes. 3. In a large frying pan over medium heat add the margarine along with the carrots, celery, corn onion and mushrooms and sauté. 4. Stir frequently and add all-purpose flour and chicken stock and continue to stir until thick for 10 minutes. 5. Once chicken is baked, remove from the oven and allow to rest before shredding or cutting into pieces. 6. Pour chicken and frozen peas into the vegetable mixture and mix well. 7. Transfer the chicken vegetable mixture into a casserole dish and bake for 30 minutes. In the last 5 minutes of the baking process and the biscuits and then serve immediately. 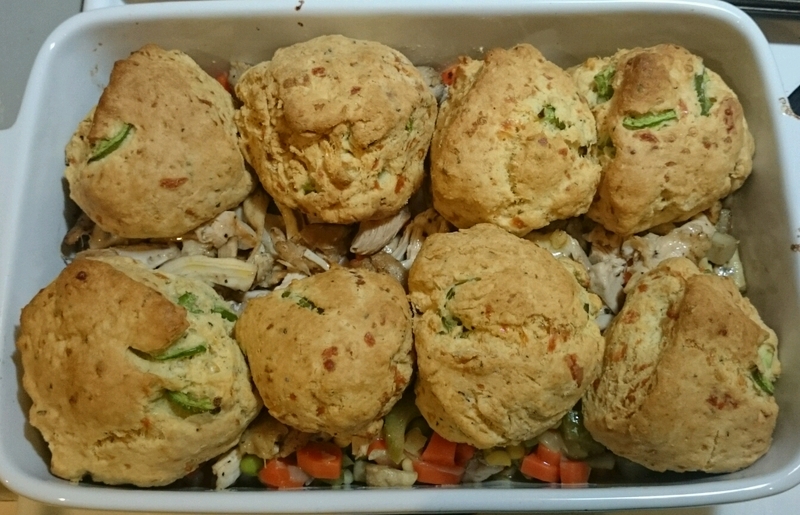 •	Make biscuits the day before if desired or bake the biscuits prior to starting the chicken pot pie recipe. Cook Time: 15 – 20 min. 8. Preheat oven to 400°F. 9. Line a baking sheet with parchment paper. 10. Using a large sized bowl mix flour, cornmeal, baking powder, baking soda and salt together with a whisk. 11. Using your hands add butter and mix until the mixture resembles coarse crumbs. 12. Add cheese and jalapenos. 13. Slowly add milk incorporating until dough is formed. 14. Cut dough and form into a circle and place on parchment paper. 15. Bake for 15-20 min or until golden brown or until a cake tester inserted comes out clean. •	Spray a muffin pan with non-stick cooking spray to have muffin shaped biscuits. This is one of the heartier dishes I have made and is perfect for the Autumn & Winter season as its comfort food at its best. I had many great reviews for this recipe and the biscuits were mentioned for weeks after this dish had been consumed. I was pleasantly surprised at how this turned out and there were even some leftovers. The flaky buttery biscuit on top of a rich rustic meal was just superb. I was given a bottle of red wine from a co-worker who had recently gotten marriage. The couple had given all the guests a bottle of red wine they bottled and corked at a winery in the Niagara region. Now since I don’t drink and don’t like wine I said I’d taste a small bit and would cook with the rest. I thought to do coq au vin again; but then thought I should try something else. This is when beef bourguigon came into my head. I also remember that scene from Julie & Julia where Julie says “don’t crowd the beef” and I said to myself this is a good recipe and I have never actually made a Julia Child’s recipe before. I started my prep and had everything ready to go and all that was left was to open the wine (queue the ominous music). Since it’s 2016 I made the assumption that this bottle of wine was going to be one of those twist top varieties and I was so wrong; and believe it or not I don’t even own a cork screw. So here’s where my 30 minute struggle to open a bottle of wine begins. I tried to use a knife and cut away at the cork on a slant, no luck. Then I went to my tool box; because I have a full tool box at the ready; but I don’t own a corkscrew. (I’ve never really been a conventional girl here; and have always been the work on my own car and build my own curio stand and solder this or that) hence I grabbed a screw and twisted it into the cork and then grabbed the hammer to pop it out. Still no luck and at this point I thought I was done, until I did the one thing I really didn’t want to do which was to push the cork in. I did this and strained away any cork pieces that may have broken and then pulled out the cork after the fact and retrieved my screw. Lesson learned here and I will be going to the dollar store to get myself a corkscrew as that was not a fun experience for me at all. 1. Using a frying pan, fry bacon, drain, crumble and set aside. 2. Pat dry all beef pieces and season with salt and pepper. 3. Divide flour and beef into four portions. Place batch one into a ziplock bag and coat beef. 4. Place two tablespoons of oil into a heavy bottomed pot and brown beef on all side. Don’t crowd the meat. Once the meats is browned transfer to a bowl and continue with the next batch of beef until all is browned. 5. Pour off any excess oil from the pot if necessary and then pour wine into pot to deglaze for about 1 minute. Ensure to stir and scrape up brown bits and then pour over the beef. 6. Make the bouquet garni and set aside for the moment. 7. In the pot put butter and oil over medium-high heat and put in the garlic, onions, carrots, celery, mushrooms along with the crumbled bacon and sauté until browned. 8. Add in the herbs du provence, tomato paste and parsley and continue to stir. 9. Pour in the wine and the beef along with the bouquet garni and gently simmer partially covered until the meat is tender; about 3 ½ to 4 hours and occasionally stir. 10. 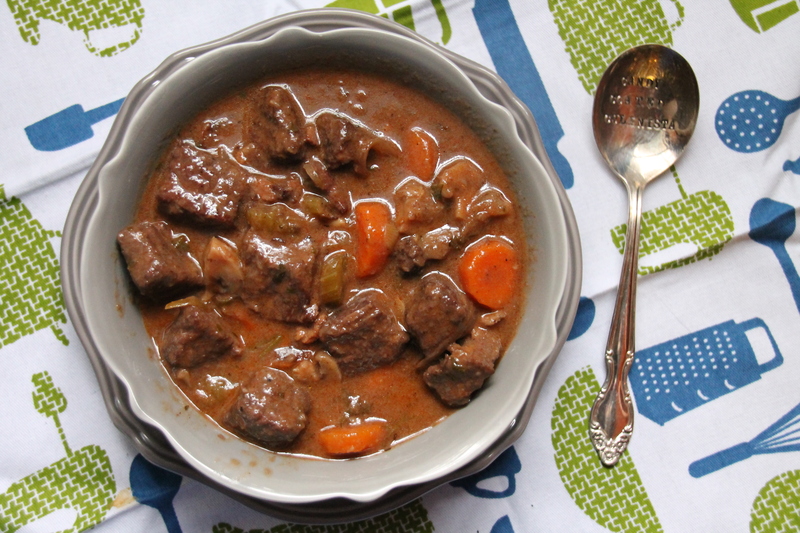 When beef bourguignon is ready remove bouquet garni and serve. •	Serve with baby potatoes or a baguette. I didn’t add the pearl onions to this recipe as I didn’t really want all of those onions in the dish. I found this recipe to be so persnickety and yes I get the whole “don’t crowd the meat”; but this recipe had a lot going on and was so finicky and Mise en Place. Maybe it’s because I have always found myself to be a more instinctual cook who doesn’t like to follow a recipe in its entirety and yes I even slightly altered a Julia Child’s recipe as sacrilege as that probably is to most; but that’s just who I am. It was still an amazing recipe with its richness the smell the wine aroma and those perfectly chopped vegetables. I can see what all that fuss was about; but in the end this recipe is still way to fussy for me and this isn’t the way I like to cook. I didn’t even have kitchen twine for the bouquet garni and I had to use a cheesecloth that I use for my almond milk. 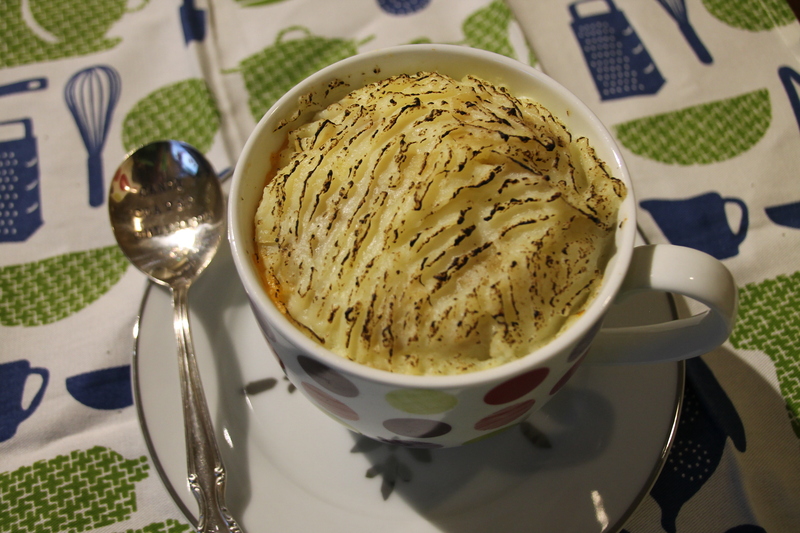 It was really quite an experience to MacGyer my way through some aspects of this recipe. I have always loved MacGyer so in some ways I got to try my hand at working with what I have on hand; but next time I will try this is a slow cooker recipe. A cold weekend is ahead and I have been craving soup in a bad way. 1. In a large heavy bottomed pot over medium-high heat, pour extra virgin olive oil and brown onions, carrots, zucchini, mushrooms, garlic, red pepper and green pepper and let brown slightly, 5 minutes. 2. Stir in tomato paste, oregano, vegetable stock, kidney beans and tomatoes and bring to a boil. 3. Add in the gluten-free pasta and let simmer until pasta is aldente. 4. Continue to let simmer and add in parmesan cheese and parsley. Such a great fall soup. Zucchini is a summer vegetable but in Ontario it can be readily found up until October and I fully took advantage of that. I have always wanted to make a minestone and this was so delicious I didn’t even miss the protein. 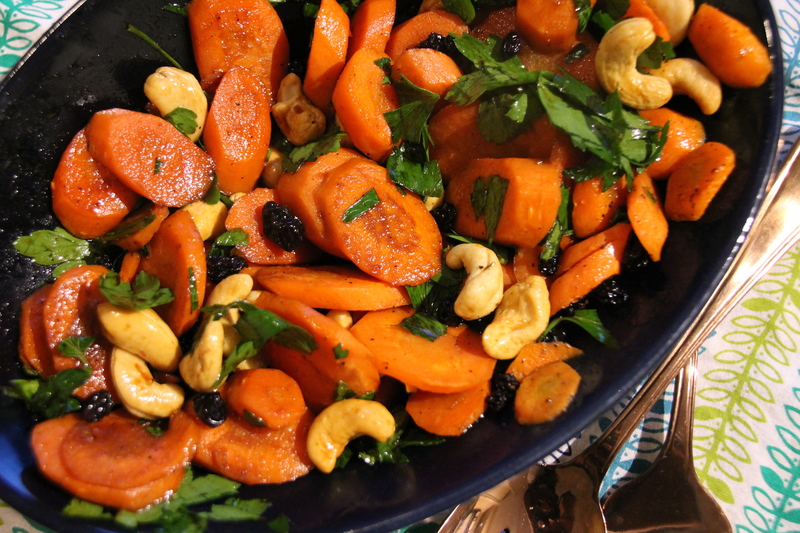 The carrots and zucchini were still crunchy and this recipe is perfect for freezing. If I can find a way to use pomegranate I will. I have always loved pomegranates and even though they are a mess to eat I enjoy cracking into it. I remember as a child when my mom gave me a pomegranate I would run upstairs to change into an old t-shirt and then have at it while sitting in front of the TV, enjoying my cartoons. This is still my routine to this day; but I also love finding different ways to incorporate pomegranate into dishes. 2. In a small saucepan over medium-high heat; let pomegranate juice reduce (10 – 15 minutes) and then stir in the molasses. 3. Peel carrots and cut on the bias and place to the roasting pan and coat the carrots. 4. Bake for 15 minutes stirring occasionally. 5. Drizzle glaze over and bake for another 10 minutes. 6. Add in the blueberries and cashews and bake for another 5 minutes. 7. Transfer to a serving dish and sprinkle with fresh parsley and serve. •	You can make the glaze in advance if necessary. The taste of this dish was great. I loved the addition of it as a glaze and this is a great and healthy vegan dish. This would be a great side for Thanksgiving or Christmas and I will be adding this to my Holiday menu. Can you believe I have never made fried rice before? 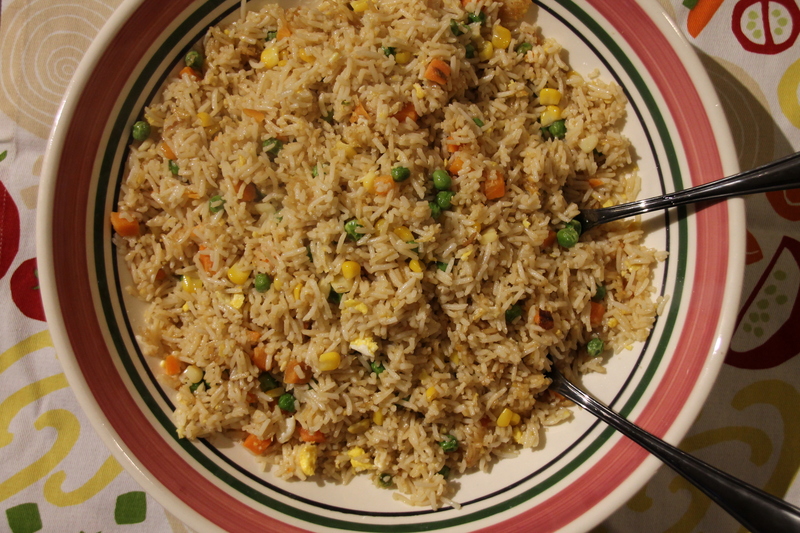 I love making stir fry and Chinese food yet I have never made fried rice. I was prepping a meal for some guests and I had planned to make just plain rice served with some teriyaki chicken breasts and on the fly I decided to turn this into a fried rice. 1. In a pot cook the rice in 2 cups of water over medium-high heat until cooked. 2. In a frying pan with 2 tbsp on sesame oil, fry onions for 4 minutes and the add garlic for 30 seconds. 3. When rice in finished cooking add onion and garlic along with the carrots, peas and corn along with the sesame oil and fry and stir frequently for 5 minutes. 4. Add eggs and continue cooking for 10 more minutes. This couldn’t be easier and this was perfect to serve family style; so everyone could help themselves at the table. This can be made the day before and then re-fried again with a little sesame oil before serving; as fried rice always tastes so much better on the second day. Having a time crunch for dinner? Have left over ground beef from last night’s pasta dinner? 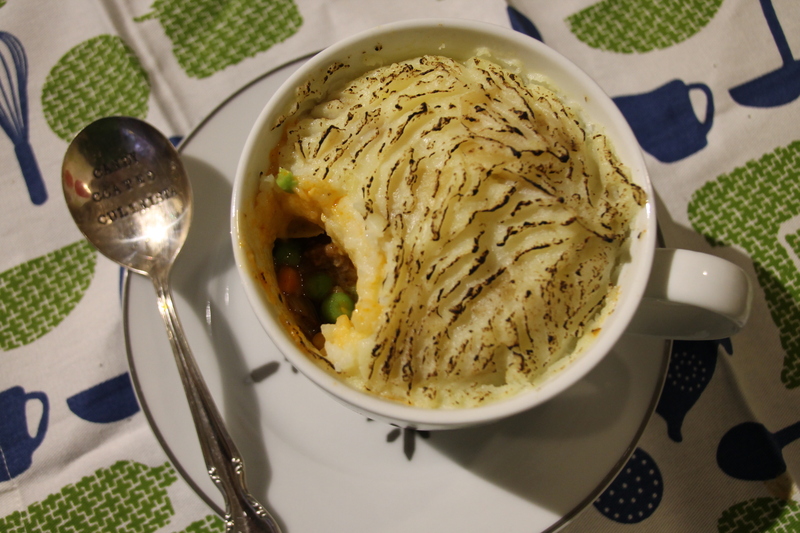 Make this twenty minute individually sized shepherd’s pie. 1. Pre-heat oven to 450°F. 3. Add onions and mushrooms to ground beef and continue to cook. 4. Wash, cut & boil the potatoes in a pot of water over high heat with a little table salt and canola oil. 6. Add pasta sauce to your ground beef and stir. 7. Once potatoes are done, strain, add butter & milk and mash. 3. Top with the potatoes. 4. Use a fork and push (on an angle) down the corners and all along the edges of the pie in the mug and make some fork scratches all along the top pie so it doesn’t look so boring. 5. Cook for 5 minutes at 450° or until top is golden brown. 6. Torch the top with a kitchen torch if desired and serve. 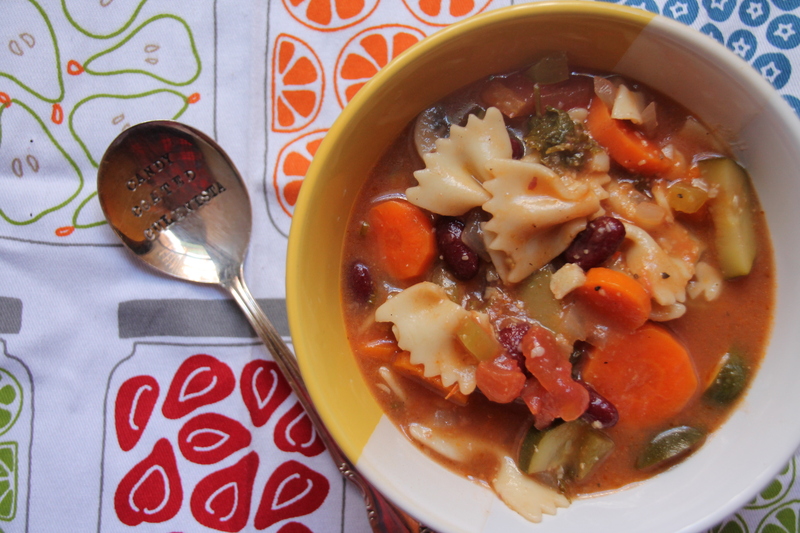 •	As this is a 20 minute recipe using canned vegetable or frozen veggies is optimal to save on time.